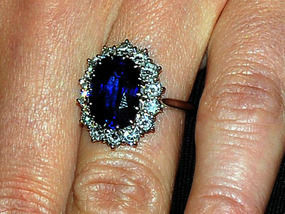 http://mikenekta.com Find the best deals of Oval Sapphire from Mike Nekta’s Engagement Rings and Bridal Jewelry Collection. Distinctly glamorous, this sapphire showcases a deep blue color – One of the finest quality gems. For more info, Call: (212) 921-4647 today or email at mikenekta@hotmail.com. if you want a ring like this i can make it happen.